Dominion Prosperity introduces a solution to the Big Money Problem that is equally surprising and ironic: bigger money. For the unacquainted, Big Money is a strategy in Dominion. It consists of buying a Province when you have 8 purchasing power or more, gold when you have 6-7 purchasing power, silver when you have 3-5 purchasing power, and nothing otherwise. Big Money is a no-fun-allowed strategy that is infamous for the cold efficiency with which it wrecks new players. Although Big Money is never the optimal strategy in a kingdom, it is usually quite strong and it takes a good player to beat it. Therefore, Big Money can ruin many games for new or casual players. Fortunately Big Money loses much of its power in Dominion Prosperity. 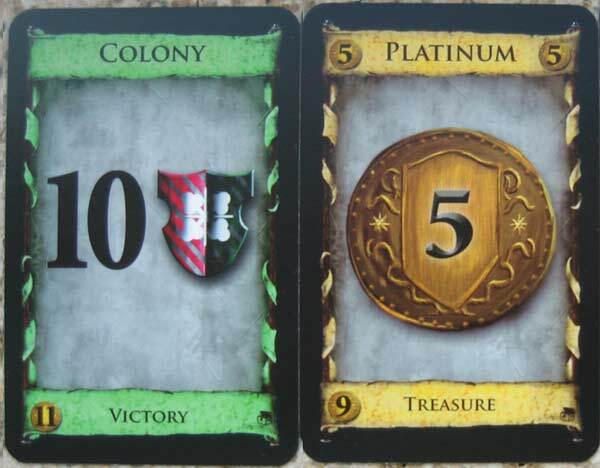 The Prosperity expansion introduces a set of very expensive cards, including a Platinum treasure card that costs 9 and is worth 5, and most importantly the Colony, which costs 11 and is worth 10 Victory Points. Big Money relies on buying the majority of the Provinces quickly. Normally in Dominion, if you buy the majority of the Provinces, you are probably going to win. But, in Dominion Prosperity, only buying the majority of the Provinces is never enough, because your opponents can simply stack up on all the Colonies that are left, which are worth a lot more points than your Provinces. Thus the natural evolution for the Big Money strategy in Dominion Prosperity is to buy Platinum with 6-10 purchasing power and Colonies with > 10. But this way it actually takes a lot of time to buy the majority of the Colonies. And this extra time gives alternative strategies that are based on action cards the time that they need to get going. And once these action based strategies are up and running, they can sometimes start buying multiple colonies per turn, which is something Big Money could never keep up with. > Click here to buy Dominion Prosperity on Amazon and start crushing Big Money strategies!